Sisters students brought home the "Best Design" award - middle-school level - from the Oregon Games Project Challenge (OGPC) last weekend. Six students from Sisters Middle School and one from Sisters Elementary School worked since November to develop their own video game to showcase at the 9th annual Challenge, held in Keiser on Saturday, April 23. The OGPC is the only statewide game-programming competition in Oregon. This platform uses video-game development as a means of engaging students in various Science, Technology, Engineering, Arts, and Mathematics (S.T.E.A.M.) disciplines while having fun. Teams must design gameplay rules and goals, write a story and develop characters, create art for the visuals, record sounds and music as well as write computer code to make it all work together. The theme of this year's OGPC was "Hidden World." At the contest, students were required to present their work to a panel of judges and "sell" their product. Games were up for prizes in a variety of categories including Game Design, Art and Assets, Theme and Style, Professionalism, Programming and other focus areas - all at both the middle and high school levels. Ashton King (6th grade), Grey Louvar (5th grade), Taine Martin (5th grade), Ilya Goheen (5th grade), Conrad Irlan (4th grade), and Clayten Heurberger (5th grade) developed their game "World Traveler" over the last six months so they could participate in the contest. World Traveler used the popular game Minecraft as a platform. "We took Minecraft and rewrote it in Java," says Ashton King, the oldest of the participants. "Players imagine they are a man who has the power to travel through dimensions." Players advance through different dimensions including air, fire, plant, arctic and steel - and collect "heartstones" to become more powerful and defeat the villain, Chaos. "This took a lot of teamwork," said Jennifer King, Ashton's mother. "Each player took on their own dimension, and then as a team they brought it all together in their own game." Clayten Heurberger wrote original music that was included in the game. The team also took on the task of configuring a router at the new Sisters Tech Space on the corner of Elm and Hood. This router allowed for anyone, all over the world, to access and play the game. 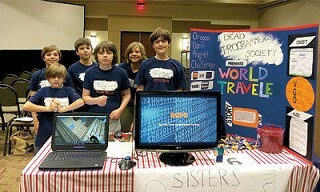 The group had a version of World Traveler available at the Sisters Science Fair in February. They used this opportunity to "beta-test" the game and gain feedback from participants. "I loved building and making the game - that was my favorite part," said Ashton. The S.T.E.A.M. components of the challenge allowed many of the participating teams to use the Challenge as a school or class project. Aspects of the game design were written into different curricula so students could relate their love of gaming to skills learned in the classroom. Of the 52 teams competing at the OGPC this past weekend, the Sisters team was the only team not officially sponsored by their school. The Sisters students met at City Hall and worked with Tricia Louvar as their coach and Stephen King as their technical advisor. "Anyone can join this group," said Jennifer. "There are a few academic-focused co-curriculars in Sisters for students, but we would love there to be more."